Simon Costa AO is a shining example of how one person can make a remarkable difference. The 51-year-old Kew resident was recently recognised for his years of tireless humanitarian work with the United Nations World Food Programme (UNWFP), by being appointed an Officer of the Order of Australia in this year’s Australia Day honours. A man who has literally changed the lives of millions, Costa’s philanthropic journey began at a crossroads. At 37, he was appointed to lead one of Australia’s largest private organisations and the largest horticulture and supply-chain company in the Southern Hemisphere: the Costa Group of Companies. Responsible for over 13,000 employees and 35 business operations, Costa was the embodiment of corporate success. “I was very fortunate to have achieved professional success at a young age,” he says. Having climbed the corporate ladder, Costa began reflecting on his purpose in life and the legacy he wanted to leave behind. “I certainly didn’t feel a meaningful legacy would be represented by the amount of money I had in my bank account or the number of assets I leave to my children,” he continues. In 2011, after years of thoughtful consideration, Costa made the life-changing decision to step away from all corporate responsibilities and get involved with tackling two of the world’s most significant problems: starvation and poverty in developing countries. It’s a move he says wouldn’t have been possible without the support of his wife Lisa – daughter of renowned Italian businessman Pasquale “Pat” LaManna – and their daughters Gemma, 17, and Sarah, 14. Costa says he was also backed by his wider family, including his uncle Frank Costa, who played a large part in the philanthropist’s upbringing after his parents died in a road incident when he was just five years old. In 2012, Costa joined the UNWFP on a handshake and informal agreement that he would volunteer for six months, sharing his expertise in logistical and supply chain systems to support the 90 per cent of the population in sub-Saharan Africa whose lives revolve around agriculture. “I never expected the work would become such a passion for me,” he says. Costa also never imagined he’d go on to spearhead an initiative with the potential to save millions of tonnes of food every year and enable millions of African families to have a consistent source of income for the first time in their lives. The compassionate businessman was initially shocked to discover the scale of the food loss problem and the lack of urgency to address the causal issues. “Everywhere I went, the priority seemed to be studying the problem, not solving the problem,” he explains. The more Costa travelled around the region meeting local farmers, the clearer it became to him that there was a simple solution to the widespread poverty and hunger they were suffering from. “I was confronted by so many agricultural, supply chain and marketing problems which didn’t exist in developed countries,” he says. With the benefit of the myriad studies conducted on the issue over recent decades, Costa concluded there were four main factors required to eradicate the hardship; access to affordable finance; access to quality farming equipment; access to adequate post-harvest storage facilities; and access to reliable markets to sell crops. Interestingly, food shortage was not an issue. The main problem was the inability of farmers to adequately manage their crops after harvest. “In the same regions where countless people are severely malnourished, there are millions of tonnes of food produced every year and never consumed, as a result of some very simple inefficiencies in the supply chain,” Costa says. Costa and his team soon launched a pilot program involving 1000 farms in eastern and western Africa to test his theory. Following the huge success of the initial pilot program, the project was expanded to include 16,000 farming families, followed by 42,000 farms. With the support of USAID, UKAID and donors such as Bill and Melinda Gates and the Rockefeller Foundation, Costa’s crew provided thousands of training workshops and built and distributed hundreds of thousands of pieces of new storage and handling equipment to farmers within the first few years. “When we started introducing the storage silos there was an enormous sense of disbelief amongst the farming communities,” Costa recalls. Towards the end of the project, students from MIT University in Boston spent four months with the farmers studying the impact of the education and technologies introduced by Costa’s team. The study indicated a 98 per cent reduction in food losses from one harvest to the next. With the project’s evolution, Costa began focusing on the other major problems leading to poverty, such as access to finance for loans, improved seeds and fertilizers, and reliable markets where farmers could sell their produce. The final puzzle piece was the establishment of a strategic alliance between the UN and seven private and public agricultural partners. The aim of the alliance was to harness the collective expertise of industry leaders to educate and empower farmers, as well as mobilise local partners. “The consortium has established a clear pathway for global food security, greatly reducing poverty and starvation in the process,” Costa says. The alliance is on target to be the first humanitarian development initiative in the world to involve over 1 million families by 2020. Despite his outstanding work, Costa is as modest as they come. His team has received widespread acknowledgement, including the UNWFP Global Innovation Challenge Award in 2015. However, Costa is reluctant to accept the praise he deserves. “If we had invented something, then give us an award for innovation,” he says. “But all we did was look at what was working in developed countries, that had not been introduced in Africa, and join the dots. Having spent most of his time in Africa in the field and with the families his project was bringing out of poverty, Costa says the real reward for him was being part of a sustainable change. “Most of the families we have helped are telling us their top priority for using their new income is the education of their children,” he says. 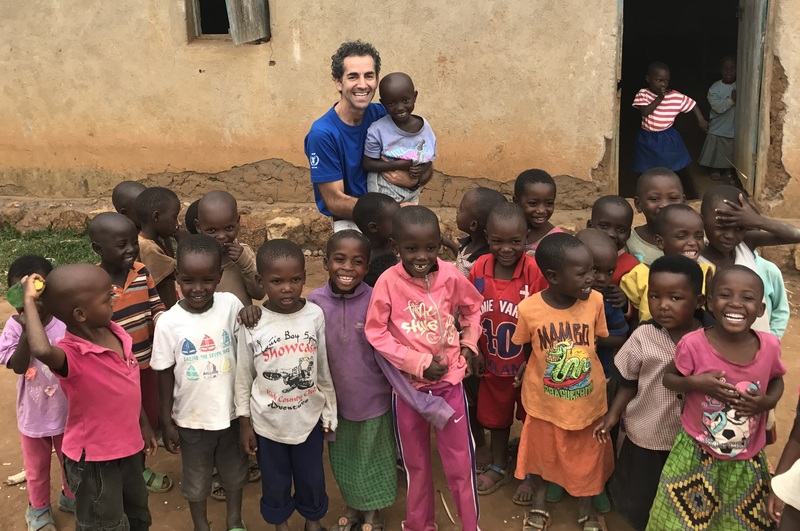 Having achieved in seven years what many wouldn’t dream of achieving in a lifetime, Costa stepped away from his work at the UNWFP last October, in order to focus on his own family. “I got to a point where I felt I was doing so much for other families but neglecting my own,” he admits. During his time abroad, Costa managed to be with his loved ones as little as three times a year. “They weren’t able to visit many of the areas where we were working, so we would meet somewhere in Europe or Asia, or safer parts of Africa, and try to make up for the months spent apart,” Costa says. Now that he’s back on Australian soil, Costa is planning to spend the next six months with his family... a well-earned reward for years of sacrifices and selflessness. Speaking of family, Costa’s Italian ancestors faced some of the very same problems he has spent the better part of a decade addressing. Costa’s grandfather Tony came from a family of successful winemakers in the town of Valdichiesa, on the Sicilian island of Salina. In the late 1800s, phylloxera plagued the island, wiping out all the crops. “They were in a desperate state in Salina, because they were unable to protect the crops they’d produced,” Costa reflects. With their livelihood destroyed, the Costa family had no choice but to send their children away. The youngest son, Tony, was the last to leave Salina, arriving in Australia at the turn of the century. Tony later met and married Mary Piccone, also hailing from Salina, and they had five sons: Frank, Adrian (Simon’s father), Anthony, Kevin and Robert. While the Costa family went on to dominate the Australian food industry, Simon Costa played a prominent role in developing the business, while also creating a lasting legacy he, his family and the Italian community can be proud of. “You walk away from the comforts of home praying you will make a positive impact on a small number of families,” he concludes. Everywhere I went, the priority seemed to be studying the problem, not solving the problem. They understand that education is the key to a much better life for their children. It was tough, especially for my daughters, because girls need their dads.